Just a quick update here. For the April session of Camp NaNoWriMo, I’m making a second attempt at a novel I started years ago but wasn’t ready to write. It’s science fiction, which I haven’t written in a while, and it feels good to get back into the genre. 1. Have fun! Don’t take things too seriously. Missing your daily or even overall goal isn’t the end of the world, and writing something is better than writing nothing at all. 2. It may not matter what you write, just write. If you’re dead-set on reaching your goal but you have writer’s block, make a copy of your document and just go completely nuts. Write something off the wall that would never make it to your final draft. Chances are as long as you keep writing, the creative gears will keep turning, and you may just come up with a way past your block. 3. Put it away for a while. When I find myself stuck, I usually head for some menial task, like running on the treadmill or doing the dishes. Nine times out ten, a solution to whatever I’m stuck on pops into my head within a half hour. 4. And this one is for writing in general: Write down your ideas! I use the Notes app on my iPod Touch, and I write down everything. Every little thought, however incoherent. 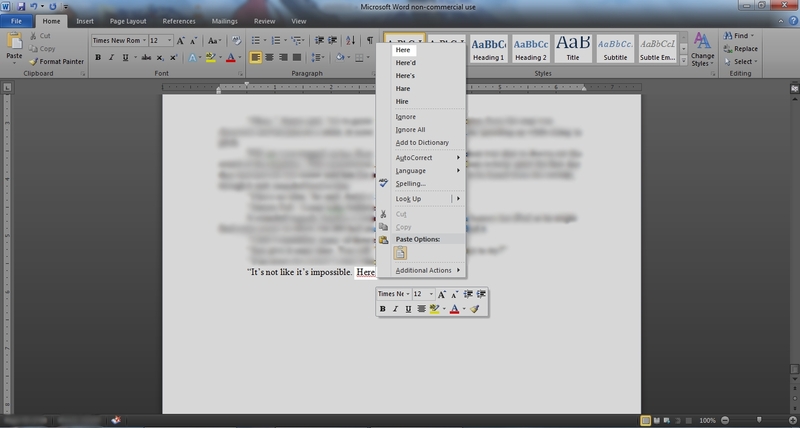 My recent novella Six and Seven started out this way. I was lying in bed, about to fall asleep, and one little thought popped into my head: Hell has seven chimneys. It took almost a year before I began fleshing that out into a story, but the result is one of my favorite works. And you never know when some little note or idea or sentence will be just what you need to get yourself moving again. Feel free to add yours in the comments. You might get a few views, and we might even be able to get a cabin going. It’s a collection of, you guessed it, resources for writers. If you have anything to add, feel free to leave a comment. After receiving my kajillionth rejection letter the other day I decided to re-think my query letter (of course it’s entirely possible that agents just don’t like my first ten pages, but that’s a beast of another color). Wondering where to begin, it occurred to me that I never finished going over the archives at QueryShark (http://queryshark.blogspot.com/). I read over a lot of them but I’m pretty sure I never got to the end. Reading over the archives is a requirement for submitting to the Shark, but that’s not why I’m doing it (the shark only bites for queries that contain something the blog hasn’t touched on, which I’m pretty sure mine doesn’t). I’m doing it just because it’s full of great advice. If you’ve never visited the site, you should probably browse the archives as well, especially if you feel like your query letter is off, or strange, or just underwhelming. In all honesty, it’s one of those websites pretty much every prospective writer should frequent. And I realize that I have a lot of such sites in mind, from blogs to sites to twitter feeds. So I’m thinking of putting up a new page on my blog. I try to give advice to writers, but my publishing history consists of two short stories, and one was a contest winner. This way, if you don’t believe me, you might find some use for my blog in a list of links to other, more credible sources of information. Of course, having information won’t automatically make you the best writer ever, but it’s a nice first step. Probably a nice first hundred steps. The rest is up to you, but it helps to have something to go by. What do you think? Should I make a page for writers’ resources? Have any sites or sources you think I should add? Where do you go when you need advice on writing? Leave me a comment. Sorry for the lack of updates. 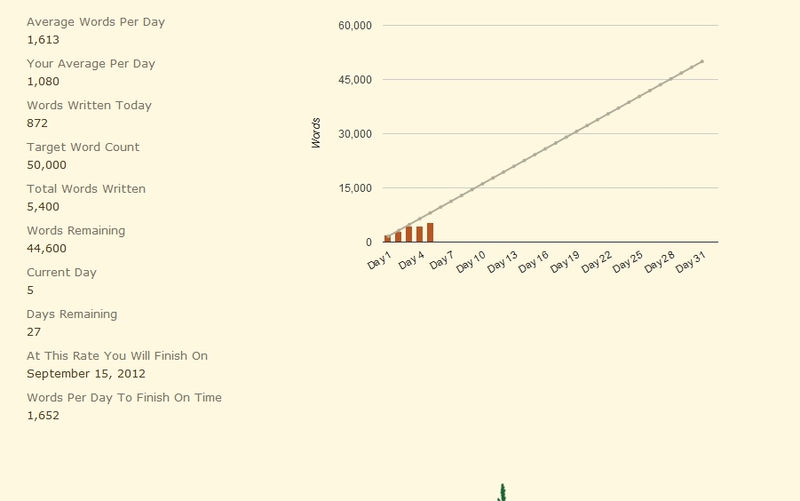 I reached my Script Frenzy goal very early on but I’m nowhere near finished. I’m also working on several other projects, mostly in the editing phase. 1. Use as many big words as possible as often as possible. 2. Describe everything in excruciating detail. 3. Tell the reader how they should feel about something. In other words, things that make the reader want to put your book down. This is a screenshot I took from my iPod. 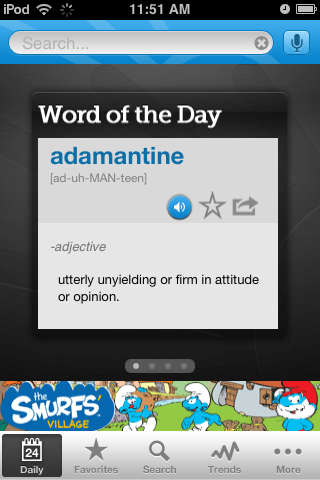 The app is the official dictionary.com app, which I highly recommend. I love the word of the day section they do, and I have a list of favorites that I pulled from there. However, I rarely get to use them. I tried once, and guess which word was the only one I had test readers complain they didn’t understand? She might have had a lot of friends had she not been so farouche. What does “farouche” mean? Ugly? Stinky? Prone to being a big fat jerk? It’s not entirely clear from this sentence alone. She might have had a lot of friends had she not been so farouche. She found it hard to talk to people because she was so shy. She found it hard to talk to people, and she might have had a lot of friends otherwise. I got rid of “shy” entirely because that’s pretty much what it means to find it hard to talk to people. This sentence doesn’t really show as much as it tells, but it does tell a lot in a few words. For example, since we’re told she might have friends otherwise, we can infer she’s probably a pretty cool person, she’s just shy. It does all of this without making the reader pick up a dictionary. Don’t use big or unconventional words just for the sake of using them. If you’re a writer, words are the only thing you have to convey what you want to other people, and unless you’re writing only for yourself, it does you no good if those words aren’t understood by anybody.